Welcome! I hope you're enjoying the hot lazy days of summer! I'm still in Christmas mode and have another card to share with your from the gorgeous Festive Holly Collection from Heartfelt Creations! Other Products: Red Pearl Metallic Cardstock, Champagne Pearl Metallic Cardstock, white cardstock, SU Real Red cardstock, Red Jute, SU Gumball Green Ink Pad, SU Real Red marker, VersaMark, Gold Metallic Ink Pad, Sparkle Sheer Shimmer Spritz, dimensionals. Instructions: Cut Champagne Pearl Cardstock 7” x 4 1/8” and cut the top corners at an angle to create a tag. Cut red mat 3 7/8” x 6 7/8” and angle the corners. Use 4” x 6” panel from the paper pad and trim to 3 7/8” x 6” and angle the corners. Using Fleur Border Basics die, cut the designer panel as shown to reveal the red mat and create a pocket. Ink the edges and adhere to the red mat. 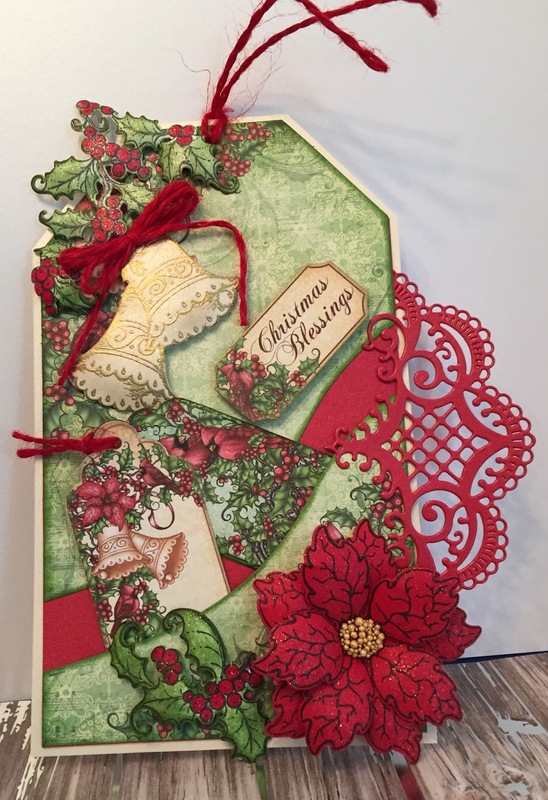 Cut the Festive Holiday ornate die and adhere to designer paper and red mat leaving the pocket opening. Using Dries Clear Adhesive adhere all to the tag base. Punch a hole in the top and add red jute. Stamp the Classic Wedding Bells on Champagne cardstock with VersaMark, heat emboss with gold embossing powder and shape. Die cut with the matching die and fussy cut as shown. Stamp the Festive Holly images on white cardstock using Memento Tuxedo black ink and cut using the matching dies. Color the leaves with Gumball Green ink using Stack and Store Daubers and color the berries with Real Red Marker and shape with the Deluxe Flower Shaping Kit. Stamp the Sparkling Poinsettias on red cardstock, cut with the matching die, shape and glue together. Use the Heart of Gold Prills for the flower centers. Spray the holly, bells and poinsettia with Sparkle Sheer Shimmer Spritz and let dry. Cut the tags from the paper pad and from champagne cardstock using the Luggage and a Tags Die, adhere together and ink the edges. Add red jute to the tags to and place them in the pocket. Adhere the Holly, Bells and the Poinsettia to the tag with dimensionals as shown. Make a multiloop bow with the red jute and adhere it to the top of the bells. Cut the Christmas Blessings tag from the paper pad, ink the edges with Metallic Gold ink and adhere with dimensionals. Thanks for stopping by...I hope you enjoyed your visit! Please take a moment to leave a comment. I love hearing from you! I love this! So much attention to detail! Beautiful card. Thank you for sharing this. Thank you so much Piyanki! Beautiful Jan! I LOVE that die cut in red!